In order to understand your requirements we need some more information. 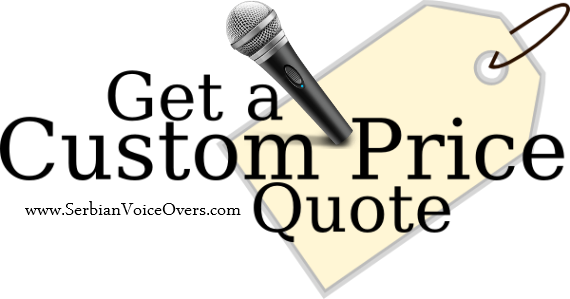 Complete the form below to submit an inquiry for a custom quote for your serbian voice over project. → Please take the time to answer all the questions. It will help us to better formulate an accurate quote. We understand how important your privacy is and will protect your personal information. you but need your number just as a back up! We need to check the availability of the serbian male or female voice talent! Voiceover sessions are scheduled according to talent availability. Please note that not all voice talents have the same rates. Every quote is valid for 30 days from issuance. When will the materials for your project be ready? Radio or tv commercial, corporate narration, e-learning, iVR ? Please include any useful voice direction here! Splitting the audio into multiple files, and naming them (number of files) ? Reading to picture (timing VO to fit with the video/graphics)? Reading to lip sync (timing VO to fit with a speaker s mouth)? If you need Word Count Tool click here!